The photos look like T-Rex is about to charge out of the trees, chasing down prey in the height of dinosaur rule. But although the plants on this mysterious island date back millions of years, the pictures are taken in modern times. Socotra is part of Yemen on the Arabian Peninsula, but it is separated from the mainland by 220 miles – which is why the plants there look so different to those which evolved elsewhere. Alone in the sea, the archipelago is known as the Galapagos of the Indian Ocean because its incredible biodiversity rivals the famous islands in the Pacific where Darwin developed his theory of evolution. 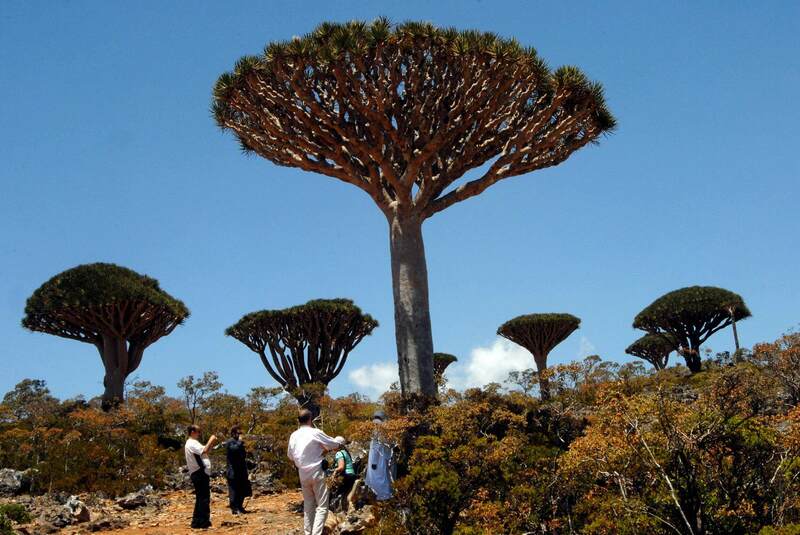 The main island of the network, also called Socotra, is famous for its incredible plants, and botanists say its flora is among the ten most endangered in the world. 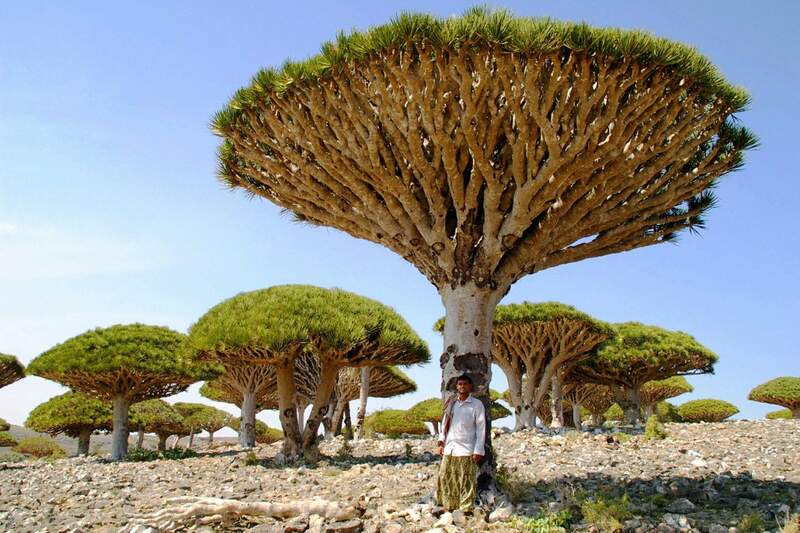 Dragon’s blood trees (above) are the most famous, with distinctive leaves growing high on the trunk and knobbly branches. They get their name from being used in Medieval magic, because their resin is dark red and was used in medicines and dyes. 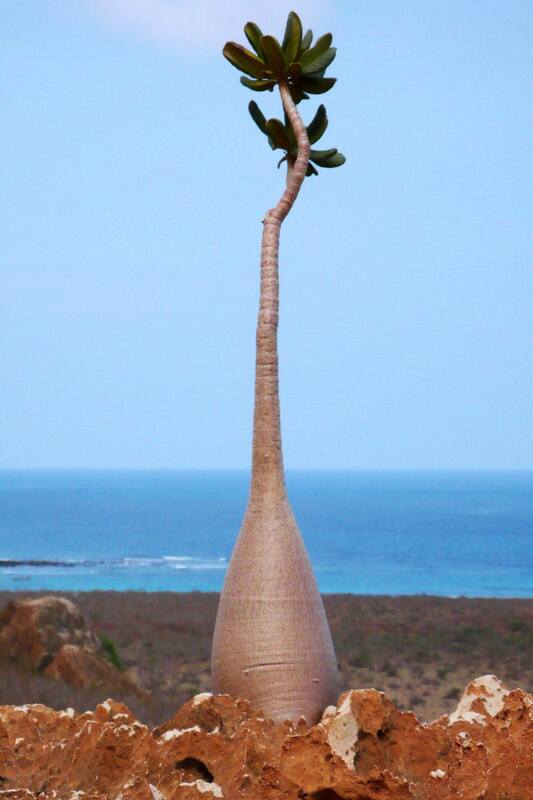 The Desert Rose, shown below and also known as Sabi Star or Kudu, are also found on the island. Their lumpy, bulbous trunks have been compared to rhinoceros legs. The rocky landscape looks part desert and part jungle, with the whole island network having a population of around 50,000 and a hot, dry, semi-desert climate. Although an airport opened in 1999, the island is still far off the beaten trap for tourists and people are advised not to travel there due to the civil war on the Yemen mainland. For now, the ‘lost island’ of Socotra remains similar to how it looked millions of years ago.